In order to discuss forage management and culture we must have some fundamental understanding of grass. While my agricultural career has been animal based, there would be no animals without the magic of plants. One thing that I have learned over the years is that all things are related and that you can not change one thing without having an impact somewhere else. At risk of giving away one of my good routines with third graders when we are teaching about soils, I challenge them to give me the name of a food that they like to eat that does not come from the soil. We then go through a series of interactive questions tracing their food suggestions back to the soil. It is a simple and fun process where I get to see a lot of little light bulbs light up over some heads. A few blank looks as well but a lot of light bulbs, sometimes even from the adults with the kids. I usually end up by telling them that without soil we would not have anything to eat, no oxygen to breathe, and no wool or cotton or leather for clothes or shoes, no wood to build houses and no clean water to drink and that if we could survive we would be standing on a rock, naked and hungry and gasping for breath. I have had kids tell me eight years later that they remember that. The point is that all things in the natural world are related. Like it or not we are a part of the natural world. What we do influences how we live. Grass is a fundamental part of that natural world. It is one of the miracles of the plant world. Plants perform the miracle of life every day. Plants take water and nutrients from the soil and through the miracle of photosynthesis, combine them with sunshine and create life and energy. That energy is stored in leaves and stems and roots. 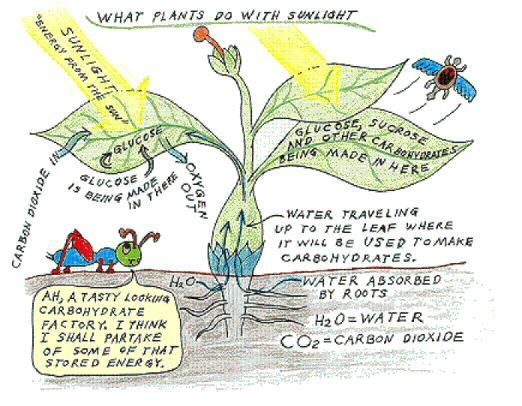 Just as described the roots take water and nutrients from the soil and carbon dioxide from the air and manufacture energy in the form of sugars and emits oxygen for the plant, giving us both energy and air. 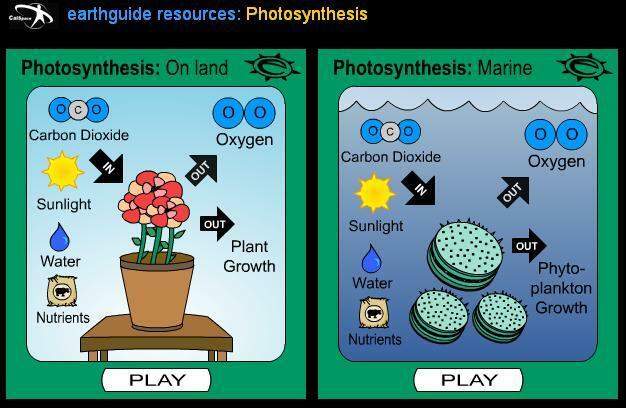 The next illustration shows that the process occurs both on land and in the water with phyto-plankton being the basis of energy and life in the oceans. The smart third grade kids always think they have got me when they bring up a seafood item, but I am fortunately not nearly as dumb as I look. For more detailed information on the processes above do some light reading on the Calvin Cycle which will take you through the chemical process of converting carbon into long chain sugars. That is more chemistry than I am capable of conveying. The plant then uses the sugars for energy and for complex carbohydrate and protein building and in many cases conversion to lignin which gives the plant its structural component. The more complex the component that the plant builds then generally the less digestible the plant is and the more long term and woody the plant becomes. But photosynthesis is the engine that drives it all. Take away the sunlight…….Game over. Take away the water…..Game over. Take away the nutrients……..you guessed it, Game over. Plants start from seed or in some cases from vegetative cuttings. At first they are energy users. Seeded plants rely on energy stored in the seed to produce a tap root and the first leaves. As the root begins to accumulate moisture and nutrients the leaves begin the photosynthesis process and the plant builds itself and begins to store energy. The stored energy is what we benefit from when we eat corn or rice or beans or any other type of seed crop. That is the energy that is to sustain the new plant. The plant builds itself by adding leaves and stems and roots. Generally for every bit of plant that you can see above ground there is an equivalent amount of plant underground. Energy is stored in all parts of the plant but the main functions of the root are assimilation and transport of water and nutrients and the storage of energy. A beneficial side effect of the root function is to hold the plant securely in the earth. Like all living things the plant is driven to go through its growth cycle and reproduce. After reproduction the plant is pretty content to go into a retirement mode and enjoy life. When and how plants reproduce influences their other characteristics. Lets talk about grasses. Lets visualize spring in fast forward. The ground warms and the robins arrive and the spring rains and sunshine begin to refresh the face of the earth. The brown tones of winter take on a greenish hue and before we know it the hum of your neighbors 46 horsepower lawnmower arouses you from a sound sleep at 7:00 am on a Sunday Morning. As you arise you wonder why that fine gentleman who needs to arise so early to commune with nature and his maker can’t go to church instead of cutting his grass. Those things aside let us examine the grass. As discussed above that grass plant wants to put roots deep into the ground and send leaves and stems upward to reproduce. It takes advantage of the warming temperatures and the lengthening daylight and produces at a prodigious rate. There are days in the spring when you can actually see corn grow. The grass is similar but harder to see. Let us use a little analogy at this point. Think of the grass plant as a small business that produces chocolate chip cookies. The small business would go to the bank or to their rich uncle and borrow start up capital to buy flower and chocolate chips and milk and sugar and eggs and an oven, packaging supplies marketing capital etc. ——- The plant gets its start up capital from the seed energy. The first few batches of cookies are made and packaged and distributed. A few dollars came in and you are ready to buy supplies for the next batch and the friendly health inspector shows up and quarantines the kitchen because you need blah- blah- blah to meet the health code regulations. This takes all the income and also a little more which means another trip on bended knee to the bank or uncle. The livestock equivalent is your horse, cow, goat, pig, llama, alpaca or other grazing animal coming along and grazing the plant prematurely. The plant reaches into the roots and pulls out whatever energy it has been able to store and attempts to regenerate its leaves. A few weeks go by and the health code needs have been purchased and implemented and cookies are baking and the aroma is wonderful and draws in the business inspector who needs to verify that you have all the proper permits. Naturally to operate a cookie business you must have the appropriate local and state permits even the ones you never heard of and by the way you must have industrial electrical service and so the business is shut down again until you complete the upgrade. Again all income is disbursed in this transaction and the bank account is again depleted and you still have not paid the egg bill this month. The animal equivalent is the plant being grazed off to ground level again before it has had time to bank any reserves. Properly permitted and electrified you once again begin to bake and even launch a new flavor cookie created while the business was dormant. You go along for a while and are putting cookies in the distribution chain and folks love them and some income comes in and sales take off and you acquire a major grocery distributor who wants a thousand dozen a week. Sales are so good that you need a bigger truck to deliver cookies. Back into the bank account. A truck costs how much? And I need a CDL driver because it has air brakes and the insurance is what? The animal equivalent is yet another grazing before the plant has banked any root reserves. But the plant struggles and puts forth a new stem or two and endeavors to survive. But it takes longer for the plant to push that stem and those first leaves up. Moisture is a little deeper in the ground than it was when it was planted and the roots have not yet made it that far down. The cookie business resumes and the banker or the rich uncle who have been carrying you see a business with new improvements and new permits and a new contract for cookies and even a new truck. They are thrilled and begin to talk about a return on their investment. One day there is a fire in the kitchen and you are shut down for another two weeks trying to get things rebuild and repaired and repermitted. No income and more bills. The animal equivalent is another grazing of the forage portion of the plant. Then some kid comes down with swine flu and his mother holds a press conference to declare that it must have come from those new cookies that little Johnnie loved so. She had learned that they were made using animal products. Sales cease. The big contract is cancelled. The health department swoops in and orders a recall of all the cookies and the kitchen is closed down until testing can prove that there is no contamination or danger to the children. You are forced to throw up your hands and take bankruptcy. All the assets of the business are put up for sale to satisfy the creditors. You have nothing, and try hard to get a job at the local bakery but your reputation is shot and no one will hire you. The animal equivalent is the plant is grazed yet again before it establishes any root reserves and unable to draw up any resources it expires and its spot is taken by a pokeberry or hardy horse nettle or red root pigweed, which your grazing animal will not eat. The take home message is that the key to maintaining a desirable stand of grass is that the plants must have time to rest and regenerate. 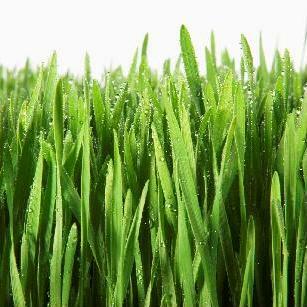 Generally, after grazing or mowing, a plant takes about five days to begin to put up new shoots. The closer it is grazed the longer it takes. If it is stressed it take longer. If it is 95 degrees and dry it takes still longer. Under optimum condition a forage plant needs thirty five days to rebuild its productive forage base and its root storage. Under stress conditions the rest phase may need to be longer. If after five days dear pony (or other grazing creature) is standing there to clip off the tasty new shoot, the plant is in danger. Grazing management is a key to maintaining a forage base.